In collaboration with A5 art collective (Romina Fuentes, Adam Grinovich, Annika Pettersson), valeveil was invited to collaborate for an upcoming public presentation. A5 and valeveil will attempt to confront an audience with the fundamental questions of creation, participation and cooperation. 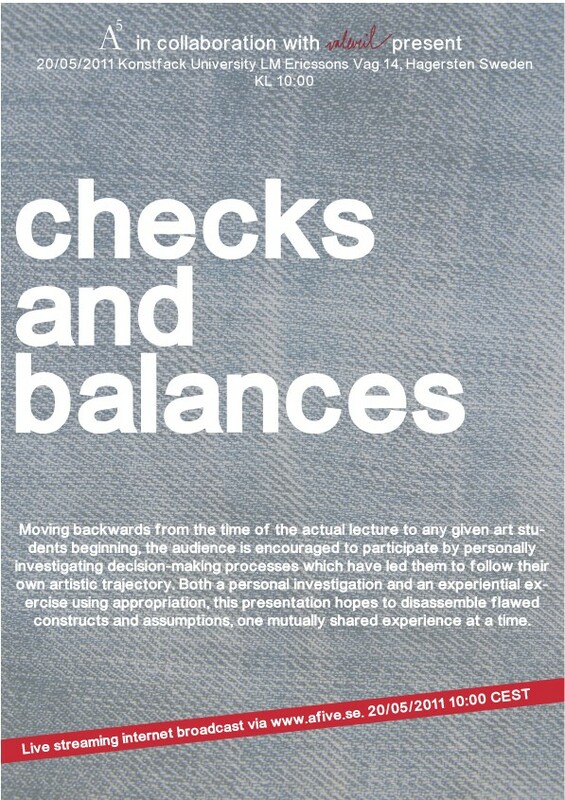 Moving backwards from the time of the actual lecture to any given art student’s beginning, the audience is encouraged to participate by personally investigating decision-making processes which have led them to follow their own artistic trajectory. Parallels exist between the construction and deconstruction of art-making and the ways in which societies/governments are founded, reformed and revolutionized. When one examines their own creative evolution, one’s idyllic castle may either crumble or withstand the reality of change. Both a personal investigation and an ekphrasis exercise using appropriation, this presentation hopes to disassemble flawed constructs and assumptions—one mutually shared experience at a time.